Thermal imaging of New York’s Times Square helps to demonstrate the urban heat island effect (Photo courtesy Nickolay Lamm, NickolayLamm.com). UPDATED (as of July 21): One of the deadliest impacts of climate change is also one of the most overlooked — extreme heat kills more Americans each year than all the other natural disasters combined. Heatwaves are especially problematic in areas with a lot of concrete and little vegetation to cool things off: Read big cities. And within those cities, it’s the poorer neighborhoods, high in industry and low in air conditioners, that are hit the hardest. Harlem, in particular, has some of the highest temperatures in the city and is home to the most vulnerable populations. It’s a big problem that gets little attention. I’m not from New York. Where’s Harlem? Harlem is the area of northern Manhattan directly above Central Park and below the Harlem River. It’s about 5.5 square miles and is home to Columbia University and the Apollo Theater. It’s also one of the biggest heat islands in the city. There are about 346,000 people living in Harlem. They’re a diverse group at about 40 percent African-American, 38 percent Hispanic, and 14 percent white. It’s also one of the poorer regions in the city. Around 40 percent of Harlem residents receive income support and 30 percent live below the poverty line. Who governs and represents Harlem? Harlem is represented by Community Boards 9, 10 and 11. It’s represented by members of Congress Jerrold Nadler, Carolyn B. Maloney and Charles Rangel. It also has five representatives in City Council, including City Councilwoman Melissa Mark-Viverito, who represents East Harlem. What are the climate risks for Harlem? Harlem faces a bevy of problems that are caused or worsened by climate change. The air quality is poor, due to the cheap and dirty oils used to energize its buildings. Its energy grid is inefficient because the infrastructure is aging. The coastline on the East River is prone to flood during extreme weather events. And then there is the so-called urban heat island effect. This is a long term that basically means cities get really hot in the summer, in part because they are cities. The concrete soaks in the sun’s rays. The scarce number of skinny trees can’t keep up to the task of cooling things down. And the cars, the AC, the trains, even the cooling systems, all generate a lot of heat, more heat than some people can handle. According to numbers from the CDC, there are approximately 600 cases of serious illnesses and 13 deaths caused by heat in New York City every year. How does urban heat affect Harlem? Extreme heat is a danger to everyone, but particularly to vulnerable communities such as the elderly, the sick and the poor. “If you remove air conditioning from the equation, the elderly and sick are more at risk,” said Brian Vant-Hull, a research scientist at the National Oceanic and Atmospheric Administration-Cooperative Remote Sensing Science & Technology Center in New York. In New York, about 80 percent of the people who die from the heat do so in their own homes. People who don’t make a lot of money are also at risk. They are more likely to live in low-quality, high density housing with poor ventilation and without access to open space and shade, which limits the ability to reduce the effect. What is a heat pocket? The urban heat island effect is a citywide problem that impacts us all, baking our homes, workplaces, and streets. But some regions within city limits get hit worse than others. Scientists call it the urban heat archipelago, or small collection of islands of heat. Cities are prone to areas that are extra hot and extra cold because the topography tends to be so varied, explained Vant-Hull. So what causes those heat pockets to get hotter? It’s a problem of heat absorption and reflection, according to Vant-Hull. “During the day, areas that are poor conductors of heat, such as asphalt, will absorb more solar energy than concrete,” he says. Asphalt can’t conduct all the heat away, so it builds up (which is why you can sometimes fry an egg on a city street). That excess heat only gets worse if the asphalt is surrounded by tall buildings that reflect light and block breezes. And if there aren’t plants and trees to absorb the heat and provide some shade, that’s a problem, too — because when night comes, and the city’s supposed to cool off, it can’t. “During the day the lack of evaporative cooling in the city is somewhat mitigated by the higher heat storage,” says Vant-Hull.“But this heat flow reverses at night so that heat flows out, warming the air at night.” When the next hot morning comes, yesterday’s heat is still there. Another important ingredient is elevation, because of heat’s tendency to rise. This is a particular problem in West Harlem, the South Bronx, Central Brooklyn and Northern Staten Island. The Bronx: Classon Point, Concourse, High Bridge, Hunts Point, Point Morris, Soundview and Throngs Neck. Brooklyn: Bedford Stuyvesant, Brownsville, Bushwick, Greenpoint, East New York, Navy Yard, Sunset Park and Williamsburg. Why do some pockets have more heat emergencies than others? The Office of the Mayor recently released this map of NYC neighborhoods most vulnerable to heat-related illnesses. If you compare it to the heat pocket list above, you’ll see that the hottest areas aren’t necessarily the most vulnerable. So what makes one neighborhood more vulnerable and another less? According to Vant-Hull, it’s, well, vulnerability. Poor neighborhoods are more likely to have low-income housing, which are more likely near a lot of asphalt and without air conditioning. I think I live in a heat pocket. What should I do to protect myself? Do what you can to stay cool and hydrated during the summer’s hottest days and try not to overexert yourself. If you can’t afford an air conditioner, New York State has a cooling assistance programto help you buy one. If you don’t want an air conditioner, the city provides a reported 500+ cooling centers in each of the five boroughs. They’re open when the city has one 100 degree day or two 95 degree days in a row. If you’d like more detailed info on how to stay safe in the heat, visit our heat safety resources page to see what the experts say about keeping healthy in the heat. For instance, the NYC Heat Brochure gives information on what the risk factors are and what to do during a heat wave to stay safe, and the Notify NYC program allows residents to receive alerts (on their phone or email) and be prepared for when unusually difficult circumstances persist. And what can I do to protect my community? If there are people in your community you think might be vulnerable to extreme heat, you should reach out to them. One of the biggest problems is that people don’t know how dangerous the heat can be. Inviting a neighbor over to share some of your AC and a cold drink could potentially save a life. 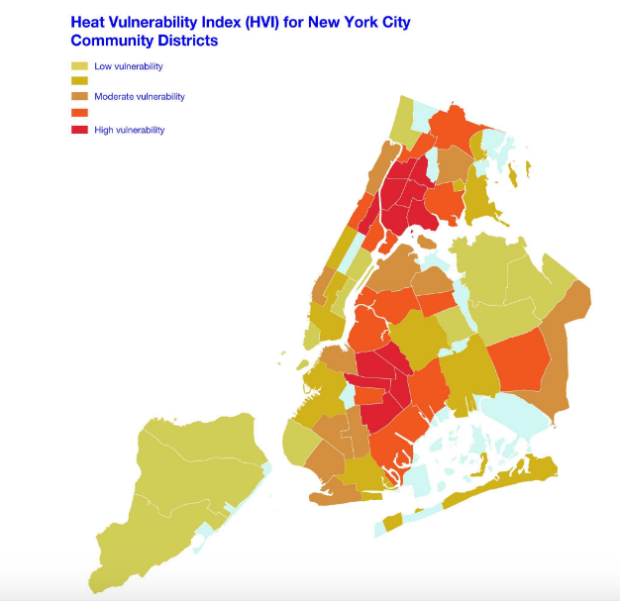 The city has launched an NYC Urban Heat Island Mitigation Working Group to research the risks of heat and given it $1.72 million in funding. The Home Energy Assistance Program provided New Yorkers with air conditioners, provided that specific income requirements were met. Last year, 4,100 households in New York State took advantage of this cooling assistance, but only 693 of those households were from NYC. Gov. Andrew Cuomo has also announced allocation of an additional $3 million to the cooling assistance program. Plus, activist groups such as our Harlem Heat Project partner We Act are working to raise awareness of urban heat island issues, while the New York City Environmental Justice Alliance this spring released a NYC Climate Justice Agenda that includes extensive discussions of city initiatives related to urban heat. If you’re looking for more information on how the heat is affecting Harlem, check out our Harlem Heat Resources page and stats on Harlem. And if you’re interested in heat in general, we’ve pulled together reports, research, and basic toolkits on our Heat Resources page. Posted in Harlem Heat, Neighborhoods Project and tagged with at-risk populations, cities, equity, extreme heat, FAQ, Harlem, health, heat, heatwaves. RSS 2.0 feed.